Andrew Miller grabbed six wickets as Billingshurst eased to a ten-wicket triumph over basement boys Lindfield on Saturday. The home side got back to winning ways in Division 2 all the while condemning their struggling visitors to their eighth defeat of the campaign. ‘Hurst, who themselves have seen their own promotion chase hit the rails in recent weeks, made light work of Lindfield. The visitors won the toss and elected to bat, but made just 115 all out in 29.4 overs as Miller opened the bowling and tormented the batting line-up. It was fellow opening bowler Andy Barr (2-39) that got his side off on the front foot, bowling openers Charlie Weir (nought) and Nathan Pugh (two) to leave them at 4-1. Miller (6-29 off 11 overs) then got in on the act as Lindfield fell to 9-3 and 17-4. Harry Moorat (19) and Tom Hinley (12) were the first to make double figures to lift them to 48-6 and 53-8. 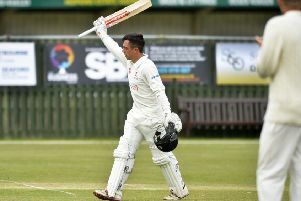 Lindfield’s best stand came between number nine Harry Chaudhary (37) and Max Kidman (20) as they put on 58 runs, but they soon finished with 115 all out. In reply, an unbeaten stand between openers Tim Weston (73*) and Tom Haynes (27*) then saw ‘Hurst home with 116-0 in the 29th over. Captain Haynes said: “It was a much needed win on the weekend that really lifted the spirits of all the lads. “Andrew Miller was exceptional with the new ball. He’s been unlucky all season so it was great to see him pick up the wickets he has deserved. “Andy Barr supported him really well from the other end before the spinners came on to finish the job. “The wicket was good so we felt chasing 115 shouldn’t be an issue. We made light work of the chase knocking it off without losing a wicket.